Accomplished model and actor, Kit Mah has graced numerous TV & Print Ad campaigns for international brands such as Carlsberg, 100 Plus, McDonald’s, Nescafe, Toyota, Citibank, Bosch, ING, Brands, Marigold, Watsons, M1, Digi and many more. 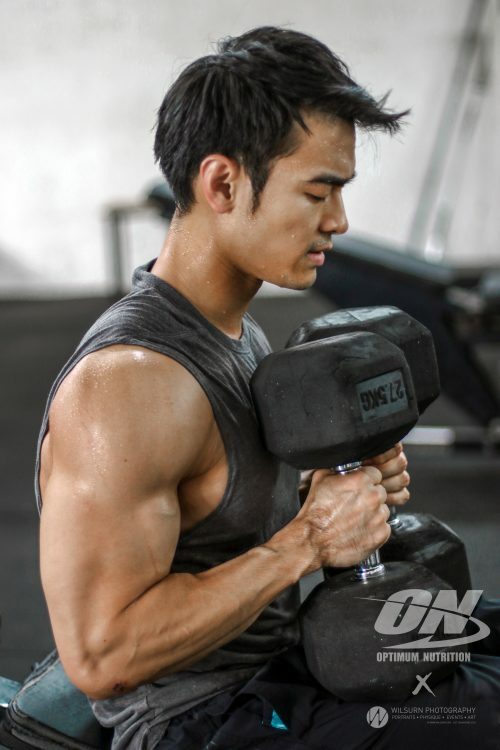 Being a fitness enthusiast, Kit maintains a consistent workout regime despite a hectic and busy lifestyle. Kit has been acted in local TV shows and also have hosted a healthy living show. 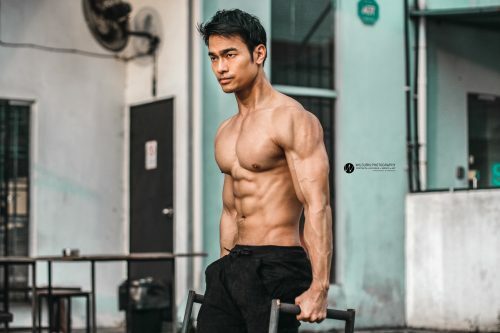 Today, he is recognized as one of Malaysia’s top fitness personality who is also an Optimum Nutrition Ambassador and Under Armour brand ambassador. Let us get to know a little more about him. CAN YOU SHARE MORE ABOUT YOURSELF? I was born in PJ. I grew up like any normal kids except I wanted to be a scientist when I was young. I was always fascinated by mysteries and also have a very curious mind. From dismantling my toys to capturing insects on the playground. This in a way led me to take up my engineering degree, however, I never expected to end up becoming a fitness personality I am today. I believe my transformation journey which started when I was 15 has led significant changes in my life. From boosting my confidence, self-esteem and improving myself physically I was able to transform my life around and been given opportunities I never imagined. I believe fitness is a lifestyle and lifelong journey. For now, I am still able to see improvement in my fitness goals despite training for over 15 years. It’s either physically or performance. Physically I enjoy being fit and having an aspirational physique. I never intended to become too huge due to modelling and also it’s easier to maintain a healthy and fit physique which suits my lifestyle very well. I may not always have the chance to eat clean all the time however my goals is to equip myself with the right knowledge so I can try. I am glad I am able to inspire my family and friends around me to be as passionate as me about fitness. To me, that’s one of the best achievement being a fitness personality so far. AT WHAT AGE DID YOU BEGIN FITNESS JOURNEY/BODYBUILDING/WORKING OUT AND WHAT MOTIVATED YOU TO KEEP WITH IT? When I was young I was very skinny. I was made fun of at school and bullied even by girls. I was the smallest and lightest guy in class and for some reason, I can’t gain any weight despite eating a lot. I thought to myself when I was young that I even don’t mind being fat because there were actually more fat people than skinny people in my school and I just wanted to fit in badly. When I reached 15 years old, it was then that I decided I wanted to be bigger and perhaps I could do so by packing on muscles for size so I started exercising. I bought dumbells from the hypermarket and also did lots of bodyweight workouts. Ever since then it has been an amazing journey of discovering my passion in fitness and one of my achievements which I am proud of was being able to transform my weak and frail physique into a healthy and fit one and in the process of doing so I have also inspired my family and friends to be as passionate about fitness too. It would be with Sylvester Stallone (his character in the movie Rocky and also Sylvester coming from a hardship background and made it as a successful actor) I hope one day my life will be made into a movie too and it will be an inspiring one. WHAT ARE SOME OF THE DIFFICULTIES MAINTAINING THE LIFESTYLE? I have 2 jobs. I have a permanent job as a Project Manager and also need to juggle my work with my shootings, event appearances and training in the gym. Sometimes during my rest days, I may choose to stay at the office to work until very late (2 am) if there is work which needs to be completed. The nature of permanent job involves me to be involved in a lot of conference calls and also present to senior management. Most of the time I deal with suppliers overseas. I interact with various parties through emails and con calls all over the global continent. During my working times at the office, I tend to minimize social time, concentrate and aim to complete my work in a fast manner as possible. I tend to take minimal rest time. If I am in the office, I will only allocate about 30 minutes to finish my lunch and sometimes I also eat my lunch in the car while driving to my meetings etc. Also, I tend to have another healthy meal after lunch (before workout) which I only allocate a maximum time of 10 minutes to complete. My second job is my part-time job in entertainment. I have been involved in modelling, acting, tv hosting and started this since when I was in university part-time. The nature of my second job involves meeting clients face to face, going for castings, wardrobe fittings, shoots, attending events and also correspondence to clients or media interview responses. The timing for all of those activities for my second job is not fixed and usually can be adjusted accordingly however for certain shoot dates and important events which I am required to attend, I will adjust my schedules to accommodate it. Example, sometimes my workout timing may change and I may workout early in the morning (6 am or so) in order for me to make it to that important event happening at night. Or if I have a shoot for 3 days, then I may have to skip my workout and also take off. Also, I will choose the jobs depending on the budget and availability as well. I always strive and make it a priority to sleep early whenever I can. Ideally before 11 pm if possible and during days which I am not working. I also try to ensure I get a short moment to meditate to help calm my mind and feel at peace from the hassle in my everyday life. such as chicken breast, tenderloin steak, salmon, dory, cod, snapper, shrimps and lamb. I practice the meat rotation concept where I would always try to rotate my meat and try not to eat the same meat for few days in a row. I know some people can eat chicken breast daily but I believe in giving your body ‘time off’ from the same food. Also, I believe in consuming plenty of vegetables. To cope with being tired of all the chewing I usually blend all my vegetables together and drink it especially during mornings when I am rushing. Of cause, I do eat my veggies too with my meals. For carbs, I prefer to take slow digesting (lower GI) such as sweet potatoes or brown rice before my training. After my training, I will tend to consume higher carb (higher GI) immediately to help with muscle recovery. For fats, I source it from nuts, avocados and fish skins. Supplements also play a role in my diet, I have my whey protein from Optimum nutrition after my workout as it is the best time to consume it. I also take multivitamins and Omega 3 fish oil. I also drink plenty of water (non-cold), avoid soft drinks. I believe in minimizing refined food and process food as much as possible (the meat I eat are usually non-processed and it should be as good quality as possible like free-range chicken, not injected with hormones, grass-fed beef etc) I am a firm believer on being healthy on the inside. I would say I adopt the paleo type of diet, however, I do not follow that exactly because I know how to reap the benefits of the insulin spike at a specific timing (after my workout) to assist with my muscles recovery and performance improvement in fitness. As above. However, I would like to stress to a majority of people out there to minimize processed or refined food. Anything which is processed or refined will spike up our insulin level. Society today is spoilt for choice as we are surrounded by food which is processed and at the same time, they taste very good, addictive and available conveniently. Only if we workout, train properly and in a certain condition we can indulge in them occasionally. We need to deserve those foods. WHAT DO YOU DO WHEN YOU ARE NOT IN THE GYM? I love to travel and travelled a lot in the recent years. Sometimes I travel with friends or for work and I will extend my trip to explore on my own too. If I am not travelling, I do enjoy ‘me’ time and spending time with myself. I like to read up and learn more about subjects which captivates me. It can be reading non-fiction or new-age books. I also play the guitar and enjoy singing. I learn guitar when I was younger and I hardly have the time to play with it now. I also try to meditate whenever I can and make it one of my lifestyle habits as it helps me to un-stress, become more self-aware and calm me down from my hectic lifestyle. I am currently working on a new business venture which I will announce in time to come soon! My ultimate cheat meal would be to start out eating a decent high amount of good quality meat first because it contains protein to help me meet my required protein goal for that meal (I feel better knowing that I have protein in my meals instead of just carbs or fats), having protein first also prevents me from overindulging in too many sweets later on. Also having a cheat meal right after protein meal can help in effectively re-glcogenate the muscles. I would like to have the meat served savoury and then followed by a nice dessert. I don’t mind having a nice burger right after my meat and my current obsession is with Nasi Lemak burgers. As for the dessert, it can be chocolate lava cake with vanilla ice cream, follow by a nice cheese cake or cheese tart and after that I will continue with tasty cookies or biscuits with a nice tasty milkshake. I was able to have all this before and it definitely made me felt good and satisfied after that! A big thank you to Kit for his time and Optimum Nutrition Singapore/Malaysia for facilitating this interview.